Shards of Alara, released in 2008, introduced us to a world that had been riven into five self-contained dimensional fragments, each characterised both by the prevalence of one colour of mana and its allies, as well as the complete absence of its enemy colours. The designers and creative team had to ask themselves what each of these five “worlds in a bubble” would look like, and one of the ways they chose to do this was through unique mechanical identity. Bant, the White shard, was given the exalted mechanic, designed to represent their honourable way of single combat. Fiery, primordial Jund had devour, which showed the food chain at work in that dangerous land. Unearth was the plaything of the necromancers and demons of Grixis, a desolate shard of endless fields of bone and ash. As for the other two, however, that’s a little less simple. Thus far in our Betrayers of Kamigawa coverage, we’ve explored the mechanical progression of the block from its founding with Champions of Kamigawa. Champions had brought in a raft of new innovations: Arcane spells, splice, soulshift, bushido, and flip cards. These are obvious and readily apparent introductions to the game, and might be called “top-level mechanics.” However, a full understanding of a set is only possible if you look past those at the bigger picture, and account for “sub-level mechanics” as well. These types of mechanics are ones without a keyword or obvious call-out, but instead are focused around themes. For Naya, the jungle home of Ajani Goldmane, Wizards didn’t offer a keyworded mechanic to give the shard its particular flavour. Instead, it tapped into the concept of the Gargantua, massively oversized creatures that populated the wilds (think Godzilla movies and the like). Thus, the “size matters” theme found its way through Naya’s allocation of cards, with a number of spells and creatures rewarding you for playing with the Gargantua (as defined here as any creature with a power of 5 or more). For Esper, the shard of artifice, another sub-level mechanic was given the spotlight in that every creature was a coloured artifact creature. It’s important to note that the terms “top-” and “sub-” aren’t meant to be taken comparatively, rather they’re indicative of visibility and perspective (think of things above and below the surface of the ocean). Although as Magic players we have a natural tendency to cluster our thought processes around keyworded concepts (which is precisely why Wizards keywords them in the first place), the developments that come without names are just as important. Consider the “loner” concept for the creatures of the night in Avacyn Restored, as typified in cards like Homicidal Seclusion. 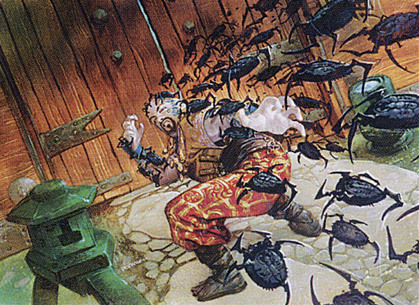 Or for another recent example, consider this: which development played a more prominent role in Scars of Mirrodin block- imprint, or the gradual bleeding of infect from Green/Black initially into all five colours. Those opting for the former may have a harder case to make. Our review of Rats’ Nest took Betrayers of Kamigawa gently to task for its lack of innovation in some areas, which left us seeing one mechanic stretched out over two different decks (Ninjutsu and Rats’ Nest) and a very limited-run top-level mechanic in offering. What was left was the perspective of the set’s sub-level mechanics, in order to set up a contrast for today’s deck to fill. Dark Devotion, you see, offers very little in the way of top-level mechanics. Instead, it draws its inspiration from one of Betrayers’ sub-level mechanics to highlight the interplay between Kamigawa’s Oni (Demon Spirits) and the Ogres who revere them. Even if you knew nothing about this relationship, you’d have a very good idea of the way things worked between them after a look through the deck- that’s the heart of the sub-level mechanic. The creatures of Dark Devotion are drawn entirely from only three different tribes: the Ogres, the Oni, and the Spirits. Easily the most populous are the Ogres, which begin appearing with your third land drop. This is a solidly midrange deck, so against aggro decks you’ll need to brace for impact, but you should have more than enough in the chamber to begin assuming control once you hit the deck’s sweet spot. Against slower decks, you’ll have more time to play with, and can begin offloading the deck’s threats onto the battlefield at a steady clip thanks to the high creature count. We’ll begin with the Ogres, and work our way through. Right off the bat, we find the Ogre’s dependance on their Oni masters to be quite apparent. Take, for instance, the Takenuma Bleeder. A 3/3 for three mana is an almost princely deal in Black, so of course there has to be a drawback. In the Bleeder’s case, it bleeds you if you don’t control a Demon, each time it attacks or blocks. In aggressive Black decks that come screaming out of the gate, this isn’t a problem (see: Vampire Lacerator). The trade-off is somewhat less palatable when your deck is vulnerable to a rush in the early game. Next up is the Villainous Ogre, a card more in line with what you might reasonably expect to get in Black for that same three mana: a 3/2 with a blocking restriction. Still, with a Demon in play the Villainous Ogre learns a nifty trick and picks up regeneration. It still can’t block (one of regeneration’s more useful applications), but it does give you the freedom to take the Villainous Ogre off the leash and swing with reckless abandon. Like the Bleeder, the deck gives you three. Red, another colour not normally associated with cost-efficient creatures, weighs in with its own version in the Shinka Gatekeeper, also a 3/2. An updated version of Tempest’s classic Jackal Pup, the Gatekeeper must be engaged with caution. The last of the abundant three-drop Ogres is the Bloodthirsty model, which is one of the strongest you have at your disposal. A 3/1, he’s quite a bit more fragile than his brethren, but if you can keep him around for a few turns he becomes the most effective form of removal you have at your disposal. The problems with the Bloodthirsty Ogre are two. First, of course, you need to have a Demon in play to use the repeatable kill feature. Secondly, timing here is everything. A late-drawn Bloodthirsty Ogre likely won’t have enough time to ‘power up’ and kill the things you most need killing. But drawn early, this is one of the deck’s must-answer threats. Moving up the mana curve, we come to a pair of four-drops. The Blood Speaker is a tutor card, helping ensure that you get to find a Demon when you need one. Although the Speaker sacrifices itself as part of the tutoring ritual, you get it right back as soon as you play your next Demon. And should you be in a good place with all the Demons you need, well, you’ve still got a reasonably solid 3/2 body on the battlefield. The other card here is your decks flip card, Initiate of Blood. The Initiate and its flip version- Goka the Unjust– dwell in the same design space that made Crushing Pain a card. Preying on the weak and wounded, if you manage to kill something off with the help of the Initiate, you get to flip it to Goka. This is actually rather subtle and clever, for without the “already dealt damage” clause on the Initiate, you could simply ping something that was about to die anyway and reap the benefit (see: Blood Cultist). Since it needs to already be damaged in the first place, this requires a great deal more finesse. Still, it’s a small price to pay for a 4/4 creature whch can deal out massive amounts of damage, for nothing more than the price of tapping. The rest of the Ogres dwell at the top of the curve, and each of them is at least a 3/3 or better. The Sokenzan Bruiser has mountainwalk, largely irrelevent but occasionally deadly. The Frost Ogre has no special abilities, but as a 5/3 can kill most opponents in four hits or less. The Deathcurse Ogre is a 3/3 with a death trigger, but is shamed overall by the printing of cards like Soulcage Fiend. Six mana is outrageous by modern standards for what you get, but on the upside it can help finish off a wounded opponent. The last card here is one of the deck’s two rares, both of them legends from their respective tribes. Heartless Hidetsugu is a 4/3 with a very nasty tap ability, forcing each player to lose half their life, rounded down. A paragon of Ogrekind, Hidestugu is a strong 4/3 even ignoring his ability to hasten the end of the game. And as we’ll see in the noncreature support, he’s one half of a combo that can win the game for you outright. Moving on from the Ogres, we find a small mass of Oni ready to receive them. Just as some of the Ogres become more powerful with a Demon in play, the Oni are appeased by having Ogres in play. For example, the Scourge of Numai is a four-mana 4/4, with the downside of forcing life loss upon you each upkeep. Of course, play an Ogre and suddenly that drawback just… disappears! Worse still is the Painwracker Oni. A bigger body, his drawback forces you to sacrifice a creature at the beginning of your upkeep. Agian, however, if you control at least one Ogre, then the blood tribute is neutralised. Finally, the deck’s second rare makes itself known as Yukora, the Prisoner. Yukora is a tremendous deal, a four-mana 5/5 body, but when he goes, he takes everyone with him- except the Ogres. Given the paucity of non-Ogres in your creature selection, this will often be a fairly marginal drawback, but one that should be borne in mind before playing it. With most everything in the deck thus far carrying a steep pricetag, the deck does offer a small suite of Spirits to keep your opponent occupied in the early game. The Bile Urchin is a 1/1 that can be popped to force a small nick of life loss against your opponent, while the Hearth Kami is in the deck to solve any equipment (or other artifacts) your opponent might play. The noncreature support suite is an eclectic mix of removal and a number of one-off effects. For removal, you have several options available to you. Torrent of Stone is a 4-damage burn spell, with the added bonus if having splice onto Arcane. Unlike as in Ninjutsu, you actually do have a few legitimate Arcane spells to splice to, so you’ll frequently get more than one use out of the spell. Given the splice cost, however, and the steep mana curve, it’s something youll want to do selectively and sparingly. For a more open-ended approach, you have a pair of Swallowing Plagues. A simple X-spell sorcery, the upside here is that the Plague actually siphons the damage over to add to your life total. Finally, you have two Calls for Blood. This spell requires a blood sacrifice, but gives another creature -X/-X rather than just doing simple damage. Even if you don’t have enough to kill an enemy beater outright, you can often use one of your blockers to do the killing work for you after you’ve sufficiently shrunken your target. With all of the damage flying around, you might find some use for Kumano’s Blessing. We’ve seen this effect before on Kumano and his pupils, as evidenced in the deck Spiritbane. This is another “silver bullet” card, in this case designed to prevent creatures from going to the graveyard. This helps keep the Spirits’ soulshift mechanic in check, but is of little use in a strictly Betrayers of Kamigawa envionment since the Spirit deck here has little soulshift to draw from. Another option is Overblaze, which lets one of your creatures deal double damage. This is the other half of the Hidetsugu instant-win combo, though it does require a little finesse to get off. Since Hidetsugu damages each player for half their life, rounded down, you need to make sure that you’re on an odd life total while your opponent is on an even one. Pull that off, and you can enjoy a well-earned victory. Finally, we end with a few Demon-themed enchantments. 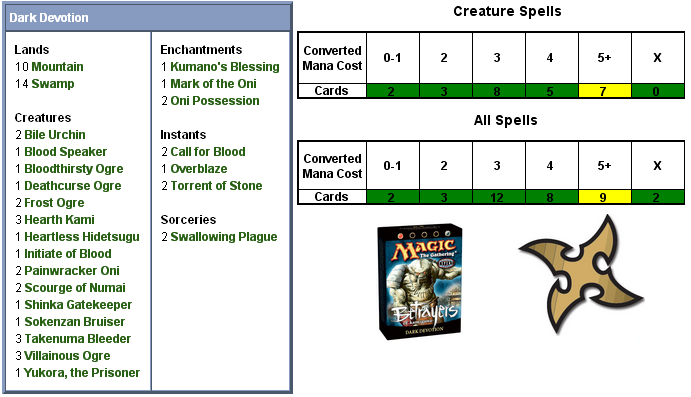 Oni Possession turns any of your creatures into a Demon Spirit, which can be useful in a pinch to activate your Ogres. The +3/+3 and trample are very relevant, and can even be used on your opponent’s creatures, though not without risk. Mark of the Oni is a Control Magic type of spell, but one that requires you to have a Demon in play to work. Overall, this tour through one of Betrayers of Kamigawa’s “sub-mechanics” has been most intriguing, and we look forward to getting the deck to the table to see how it unfolds. We’ll be back in two days to let you know! the third theme deck I got it is quite fun, although not insanely powerful. With some work it is super fun. Lord of the Pit!